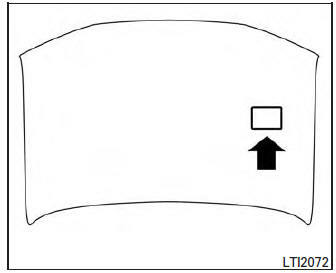 The vehicle identification number (VIN) plate is located as shown. This number is the identification for your vehicle and is used in the vehicle registration. The VIN number is also available through the center display screen. For additional information, refer to your “Navigation System Owner’s Manual”. The vehicle identification number is located as shown. 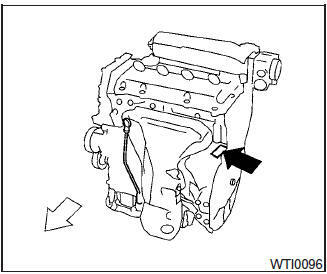 The number is stamped on the engine as shown. The Federal/Canadian Motor Vehicle Safety Standard (F.M.V.S.S./C.M.V.S.S.) certification label is affixed as shown. This label contains valuable vehicle information, such as: (GVWR), (GAWR), month and year of manufacture, (VIN), etc. Review it carefully. The emission control information label is attached to the underside of the hood as shown. The cold tire pressure is shown on the Tire and Loading Information label. The label is located as shown. The air conditioner specification label is affixed to the underside of the hood as shown.